1045 and 1018 are two grades of carbon steel as defined by the Society of Automotive Engineers (SAE). These classification number describe the components in the steel alloy as well as the properties of the finished metal. Steel alloys can have a wide range of properties, so it is very important to have the correct grade of steel for a particular application. Steel bars are manufactured in different grades. The four-digit number assigned to the various grades is a code which describes the steel. The first digit, "1," indicates a carbon steel. The second digit, "0," tells you that there are no modifications to the alloy. The final two digits relate how much carbon is in the finished steel; the amount of carbon determines the strength and ductility of the finished alloy. 1018 is a low-carbon steel, as it contains 0.18% carbon. Low-carbon steels are easily weldable and inexpensive; however, they also have low strength. The Tensile Strength, or the pressure that will break the steel, is 63,800 pounds per square inch (psi). Yield Strength, or the pressure that will permanently bend the steel is 53,700 psi. Elongation describes the amount that a sample of material will stretch before breaking; the elongation of 1018 steel is 15.0%. 1045 is a medium-carbon steel, made with 0.45% carbon. Medium-carbon steels are stronger than low-carbon steels, but not as easy to weld, and can be tempered by quenching. Yield strength for 1045 steel is much higher than that of 1018, at 76,900 psi, so if the steel needs to flex and return to its original shape, 1045 steel would be preferred to 1018. The elongation of 1045 steel is 12%, so if you need a piece of steel that would stretch before breaking, 1018 is a better choice than 1045. 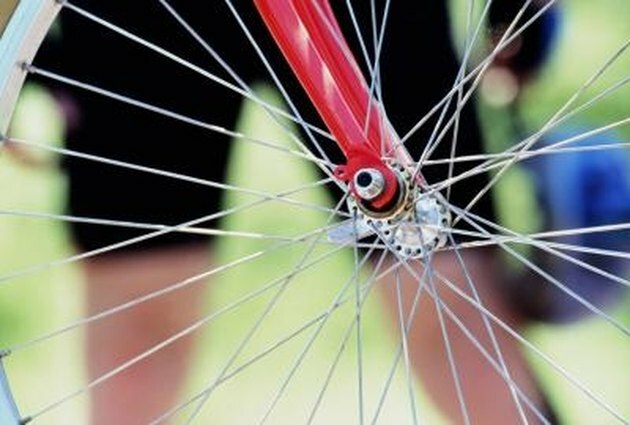 Wire spokes and an axle, two different applications of steel in a bicycle wheel. Low-carbon steels are preferred for making chain, pipe, wire and nails. Medium-carbon steels are better for crankshafts, heat treated machine parts, screws and axles.